Yesterday we showered ourselves with lovely, encouraging words. Today it is time to shower that praise and love onto someone else! 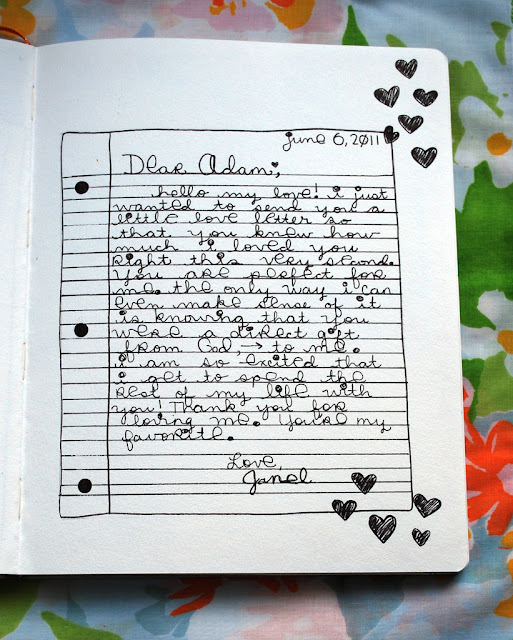 When I Adam and I were first dating, we wrote each other a ton of love letters. I have journals full of them, shoeboxes full of them, and email folders full of them. Now that we have been married for a couple of years, the love letter writing isn't as a flowing as it was. I thought that I would send out a little love letter his way just to show him how much he really means to me today, and every other day!! Thank you for the challenge, it's been awesome! Oh I thought this page was too cute! I might have to use this idea too. For the meantime, here's number 7. I also loved this prompt. I like writing letters.